An artist's rendering of a light rail stop. 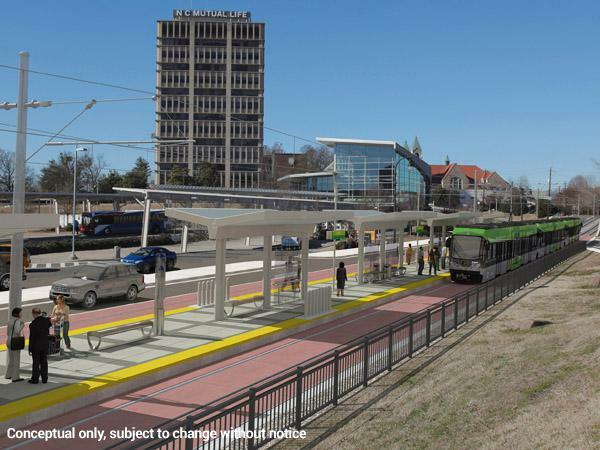 WUNC's Elizabeth Friend reports on GoTriangle's decision to end the Durham-Orange light rail project. The light-rail project has been considered the spine of Durham and Orange counties' transit plans since Durham voters in 2011 and Orange voters in 2012 approved a half-cent sales tax to invest in significant public transit improvements. As we've stated many times, the project would create and support tens of thousands of new jobs and infuse billions of dollars into our local and state economies. The final, approved light-rail alignment connects three of the top 10 employers in the state and three major hospitals as well as UNC, Duke and North Carolina Central University. Unfortunately, this project has recently faced a number of significant challenges, most notably Duke University's refusal to sign necessary agreements with GoTriangle. Duke University last month declined to sign cooperative agreements needed to secure federal funding for the project. Duke officials worried construction vibration and electromagnetic interference from the line would harm sensitive equipment in medical and research facilities along Erwin Road. North Carolina Railroad company and Norfolk Southern also declined to sign cooperative agreements. In addition, Project Director John Tallmadge told the board of trustees Wednesday the project faces a $267 million shortfall. The GoTriangle board will recommend Orange and Durham counties remove the rail line from their transit plans, bringing an end to the process of qualifying for federal dollars. Several changes to state law since 2016 brought the anticipated state contribution to the project from 25 percent to 10 percent and eventually down to no more than $190 million, or about 7.7 percent. The financial plan also anticipated that $102.5 million in light-rail project funding would come from other public and private sources, including property donations through the GoTransit Partners' Capital Campaign. The prolonged and ultimately unfruitful negotiations with Duke University halted those fundraising efforts, according to GoTriangle. The 2018 legislative change also required that all other nonfederal funds for the project be committed by April 30, and all federal funds no later than Nov. 30, for the light rail to receive any state funding for the project. Duke University officials announced Wednesday that they won't sign a cooperative agreement to advance the Durham-Orange light rail plan. That leaves Durham city and transportation officials scrambling to come up with an alternative, or see the project die.